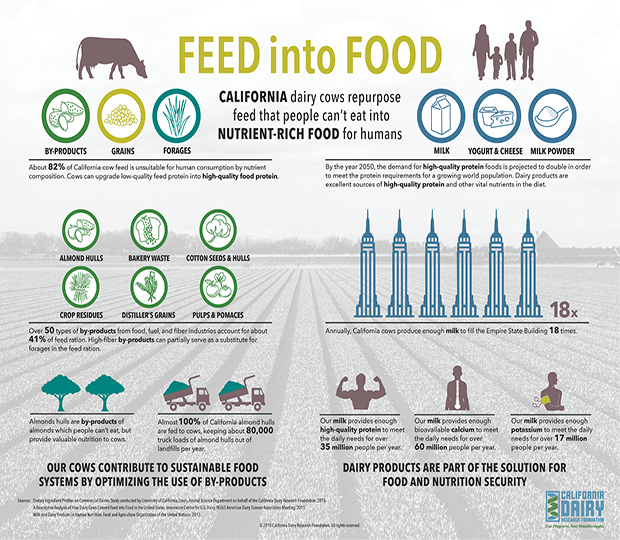 The California dairy industry is leading the way in producing sustainable food. Producing 42.3 billion pounds of milk in 2014 (more than one-fifth of the nationwide total), California dairy producers have become an integral part of sustainable food systems: repurposing huge amounts of agricultural byproducts that are inedible or not valued as human food, and converting them into nutrient-rich, affordable and delicious dairy products. The world population currently numbers 7.3 billion people, of which more one billion are malnourished and more than 805 million face hunger. Even in the United States, hunger is an everyday reality for 9.6 million Americans, including 3 million children. As the world population increases to a projected 9.6 billion people by 2050, food production will have to increase by 60 percent, and food and nutrition security will continue to be urgent national and global issues. Protein is the limiting nutrient for health in many regions, and is critically needed to combat malnutrition and a range of nutritional deficiencies. Yet not all proteins are created equal. Animal-source foods (milk, meat and eggs) are high in protein, supplementing and adding diversity to plant-based diets. Demand for these foods is projected to double to meet global needs by 2050. Global milk consumption is also growing, with demand by 2050 projected to increase by 50 percent. Milk and dairy products are considered high-quality protein sources that provide the full package of essential amino acids needed for muscle function and maintenance; plus nine essential nutrients supporting bone health, and heart and nerve function. Milk and dairy products therefore make a vital contribution to supporting healthy people and healthy communities. California milk alone is able to provide enough protein to meet the full daily recommendations for over 35 million people, while concurrently providing enough calcium to meet the daily recommendations for over 60 million people. Food production systems which are focused on foods and beverages, such as milk and milk products, which provide high levels of both protein and essential nutrients will be crucial for securing the nutrition necessary to feed our growing population and its future generations. The challenge of fulfilling the nutritional demands of a growing population while combating malnutrition is compounded by the need to reduce our environmental footprint and protect valuable ecosystems. Every human activity uses natural resources (land, water, energy, etc.) and all food production systems have an environmental impact. Considerable diversity within food systems means that nutritional, environmental, economic and social impacts vary; fortunately, milk has the lowest carbon footprint of animal-source foods, therefore reducing greenhouse gas emissions in a world where climate change is a significant concern. Yet can dairy production be part of a sustainable food system? According to the Food and Agriculture Organization of the United Nations, sustainable food systems deliver food and nutrition security for all, while reducing environmental impacts and keeping food production economically and socially viable. These systems must use resources efficiently throughout. It is often suggested that dairy cows compete for resources with human food production, thereby contributing to food and nutrition insecurity. Some animal feed crops clearly compete with human food production, and (as with other livestock) dairy production does compete for natural resources such as local land and water use, and global trade. Yet more than 80 percent of dairy cow feed is not suitable for human consumption. Cattle have a unique four-stomached digestive system, including a rumen that helps them obtain the nutrients they need from food and crop byproducts that humans don’t or won’t consume. Dairy cows can convert more than 50 different categories of byproducts from food, fuel, and fiber industries (including cottonseeds and hulls, crop residues, distiller’s grain, fruit pulps and pomaces, and bakery waste), into milk, providing an incredible contribution to resource-efficient sustainable food systems. In essence, dairy cows efficiently upgrade low quality feed protein into high-quality food protein for human consumption. The California dairy industry epitomizes this resource use efficiency. A recent analysis showed that approximately 82 percent of California cow feed is unsuitable for human consumption. 41 percent of feed used by California dairy cows is comprised of human-inedible forage such as alfalfa hay, corn silage and earlage, and cereal silage; while 18 percent comprises corn grain. The remaining 41 percent is comprised entirely of high-fiber byproducts from other agricultural industries — which reduces reliance on forages such as hay and alfalfa. Lesser reliance on forage means a relative reduction in the amount of water that would otherwise be used to grow feed crops. At the same time, using byproduct feeds means that more land can be freed for human food production. The California almond industry produces a notable quantity of byproduct feeds in the form of almond hulls and shells that used to be burned or used as livestock bedding, before dairy producers began using them as cattle feed. Nowadays, almond hull usage for California dairy feed accounts for approximately 2 million tons each year – almost 100 percent of almond hulls produced by California’s growers. This is equivalent to 80,000 truckloads, all of which are kept out of landfill. Feeding food and fiber by-products such as almond hulls to dairy cows is the most economically and environmentally ingenious way of disposing of these materials. No single solution exists to create a sustainable food future — a menu of consumption and production-focused strategies is needed to close the food gap, improve food and nutrition security and generate environmental, health, and development co-benefits. California’s dairy producers are continuously doing their part to integrate science-based best sustainability practices to their businesses and brands. By using byproduct feeds to produce nutrient-rich dairy products, they are playing a leading role in providing high-quality protein for our communities, through resilient, sustainable food production systems. Rather than focusing simply on the environmentally depleting effects of food production, we need to recognize the amazing synergies between dairy systems and other agricultural industries (e.g. almond production) and the benefits this brings to human health and society. Being part of the sustainable food systems benefits dairy producers and customers alike – it is a win-win situation.